Which prime lens is best for you? Sharpness is often the first casualty, and barrel and pin-cushion distortions often appear at the wide-angle and telephoto ends of the zoom range respectively. You can also expect an increase in chromatic aberration (colour fringing around high-contrast edges in a scene) and vignetting (darkened corners). The latter effect is most commonly seen when you're using large apertures at the wide-angle end. Zoom lenses are also often more prone to ghosting and flare. Switch to a high-quality prime lens and distortion and vignetting should be much less noticeable. Sharpness should also be excellent, so you can really make the most of the high-resolution sensors fitted to Nikon's current range of DSLRs. A dramatic decrease in colour fringing is good to have too. Even though recent Nikon DSLRs tune out chromatic aberration when you shoot in JPEG mode or process raw images with Nikon software, it won't be corrected if you use an independent program such as Photoshop Elements for converting NEF files. A big bonus of prime lenses is that they're usually 'faster'. This means they have a larger maximum aperture, which enables quicker shutter speeds. For example, a typical 18-55mm zoom lens has a maximum aperture of roughly f/4 at the wide-angle end, shrinking to a mere f/5.6 at about 50mm. Switch to a 50mm f/1.4 prime lens and the largest available aperture is four stops faster. In low light you'd be limited to a shutter speed of, say, 1/15 sec with a typical zoom (unless you increase your ISO setting). However, an f/1.4 lens will enable a much faster shutter speed of 1/250 sec. An f/1.8 lens is 3.3 stops faster than an f/5.6 lens, and even an f/2.8 model is two stops faster. So-called 'faster' lenses aren't just good for avoiding camera-shake and freezing the action in dull lighting conditions. Another big advantage is that you can get a much tighter depth of field, enabling you to isolate the main point of interest in a shot by blurring the background. It's a favourite trick in portraiture, especially when the background is cluttered and would otherwise be a distraction. It can be tricky to use large apertures in bright, sunny conditions, but you can get round the problem by fitting a neutral density (ND) filter. Variable NDs are a great option when you're shooting video and want the cinematic, shallow depth of field that's all the rage. An important factor to consider when you're buying a prime lens is which focal length to go for. Back in the days of 35mm film, a 50mm prime was considered a 'standard' lens. That's because it gives pretty much the same perspective as viewing a scene with the human eye, without the magnification of a telephoto lens or the shrinkage a wide-angle lens uses to squeeze more into the frame. For those with a full-frame Nikon SLR such as the D700 or D800, the sensor is the same size as a 35mm frame of film. 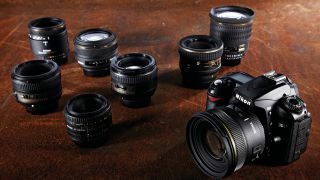 Therefore, a 50mm lens can still be regarded as a standard prime lens, whereas 35mm and 28mm lenses offer increasingly wide-angle potential with progressively wider angles of view. However, everything changes when you're using more typical Nikon DSLRs that have an APS-C format (Advanced Photo System - Classic) sensor. Because APS-C format sensors are smaller than their full-frame counterparts, only the central area of the image circle from a full-frame compatible lens is used. This is known as the crop factor, which works out as 1.5x for Nikon DSLRs from the D3100 to the D7000 and D300s. A 28mm or 35mm lens will therefore give you an effective focal length of 42mm or 52.5mm respectively, which feels much more like a standard prime on these cameras. Fit a 50mm lens to an APS-C format body and you get an effective focal length of 75mm. This is a little long for standard shooting, but absolutely perfect for portraiture. The short telephoto equivalent enables you to keep a comfortable distance from your subject, which means they're less likely to feel too crowded and can be more relaxed and uninhibited. This attitude will really show through in the photos you take. While so-called FX lenses are compatible with both full-frame and APS-C format bodies, DX lenses are designed specifically for APS-C bodies and can't generally be used on full-frame DSLRs. This is because the reduced size of the image circle produced by the lens isn't large enough to cover the whole of an FX sensor. However, some Nikon full-frame cameras have a crop mode that enables you to use DX lenses.